One of the great things about a topic such as Bigfoot is there is an abundance of information out there for the consumer to search through. There is everything from all types of literature to photography and even videos. Now whether this so-called evidence is real or a series of hoaxes is beside the point for this particular article. We have never been so close to instant gratification when it comes to so many things in life these modern days. The Internet in general has opened the world to information, learning and communication. This is one of the major reasons why the Bigfoot allure has become so vast the last few years. 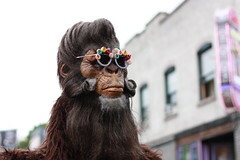 Thanks to mass media the legend of Bigfoot has propagated intentionally or not. TV shows such as Finding Bigfoot and online websites such as Sasquatch blogs and Bigfoot forums are flourishing with all types of people discussing and debating their points of view on the elusive creature. One of the best online resources to discuss Bigfoot and for that matter all types of creatures, Cryptids are all the different blogs and Bigfoot forums available on the World Wide Web. It is a very good way to discuss your opinions while at the same time reading up on what others have to say and feel about the topic. There are hundreds of very passionate people discussing Bigfoot on a daily basis all across the Internet. There are the individual blogs with individual opinions and then you have the Bigfoot forums which usually consists of hundreds of people discussing the subject on a detailed level. Of course like anything else on the Internet the level of quality of discussion will vary depending from site to site. One thing great about the Bigfoot forums is their usually broken down into various specific topics surrounding the Bigfoot mystery. Which usually makes a very convenient if you’re searching for specific discussion such as the Roger Patterson (PGF) film or Bigfoot tracks. It’s a great way to do Sasquatch research and discuss your findings in addition to Bigfoot encounters of others in real time. Who knows you might enjoy the discussions so much you might even open your own Bigfoot blog just like I did!